Email Your Lawmakers to Co-Sponsor the Fund Our Future Bills! ENTER YOUR ADDRESS AND CLICK THE "START WRITING" BUTTON (to your right on a computer, above this paragraph on mobile) TO SEND YOUR LETTER TO YOUR LAWMAKERS! Check the bottom of this page to see if your lawmakers have already co-sponsored! While an email is a good start, click here to make a follow-up call to your lawmakers. As our public schools and colleges in Massachusetts continue to scrape by with the bare minimum, Beacon Hill lawmakers are getting ready for a school funding debate that could drastically improve how our schools and colleges are funded, or not. But students, parents, and teachers from across the state are fighting back by making phone calls and emails to their lawmakers to ask them to co-sponsor the Fund Our Future bills! We’ve launched the Fund Our Future campaign by filing the Promise Act to fund K-12 public schools and the Cherish Act to fund public higher education. We’re calling on the Legislature to make this major reinvestment in public education this spring – in time for local communities to include the funding in the next academic year’s budget and in time for public college students to avoid tuition and fee hikes this fall. We need your help to send the Legislature a message. 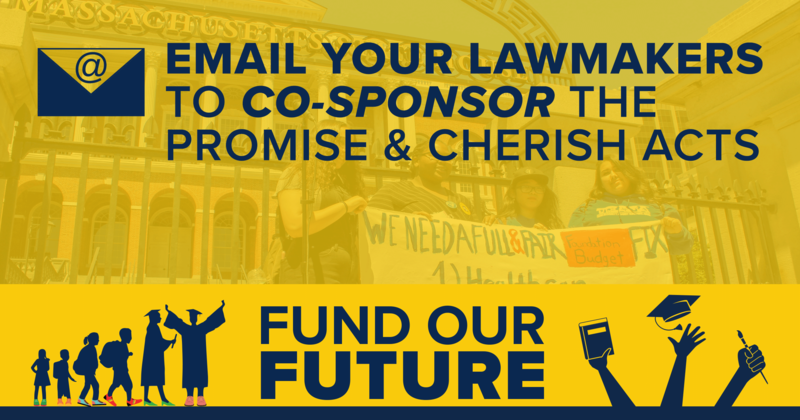 Please email and call your State Rep and State Senator and ask them to co-sponsor the Fund Our Future bills! Use this tool for emails, and click here to make a call now! After you've sent an email and made a call, take one more second to sign the Fund Our Future petition and add your name to the list of more than 15,000 people across the state who are demanding we Fund Our Future! Click here to sign the Fund Our Future petition. Right now, we have the power to make incredible change and ensure our Commonwealth prioritizes public education. Stand for all students and demand that we fund our schools and colleges!